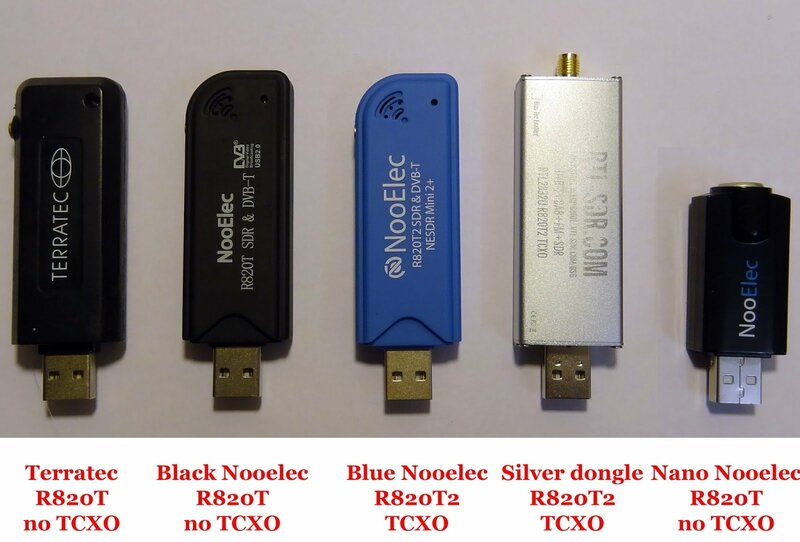 Over on the rtlsdr4everyone blog (previously known as the sdr4mariners blog), author Akos has uploaded a new post that compares 5 different RTL-SDR dongles against one another. He compares a Terratec R820T, Black Nooelec R820T, Blue Nooelec R820T2, our own RTL-SDR Blog R820T2 and a Nooelec Nano R820T. In the post Akos gives an overview of the features of each dongle, and runs tests on things like frequency drift and broadcast FM interference. He also runs SNR tests on Airband, low UHF, high UHF signals and shortwave frequencies. His tests show that the dongles with the R820T2 chip outperform the dongles with the R820T chip by about 4-5 dBs in SNR, and that the overall best dongle is our RTL-SDR Blog dongle. In the future Akos hopes to also review the Nooelec 9:1 balun. Interesting to see that my only complaint about the rtl.sdr.com dongle was mentioned – the markings on the case rub off! Good reviews. I have both the black and silver rtlsdr blog and love them. I have a couple “cheaper” ones that drive me nuts with corrections….. anyway… I like to hear all the comparisons. Thanks so much for the excellent review, the author evidently has put in a prodigious amount of work to have done such an in-depth assessment. Have used a dozen different dongles over the years and so far the ones with the TXCO are definitely less drifty and need very little if any ppm adjustment. Just got one of the “silver” dongles from RTL-SDR.com, again it’s dead accurate on frequency. Glad to see the SMA connector becoming more popular too. Kudos to Nooelec also, dealt with them in the past, very customer-oriented, friendly, and always willing to help out. Their Up-Converter gets me down to the HF band for shortwave, ham, and is good for copying utilities like RTTY, FAX etc. Works excellent. With all dongles, the better the antenna, the better the reception. And remember to use the RF gain judiciously, it’s an important control to use. Thanks for the feedback, spent almost a week listening to all varieties of signals. Just bought a RTL-SDR Silver myself… I noticed also that the magnet of the base is very weak. The day a DVB-T dongle ships with an antenna with a decent magnet in the antenna (or should I type “antenna”) base will be the day when zippers stop getting stuck, cars run on water and hell becomes the new fridge for all the tofu we’ll be eating instead of cows. Link to review is broken to the article.